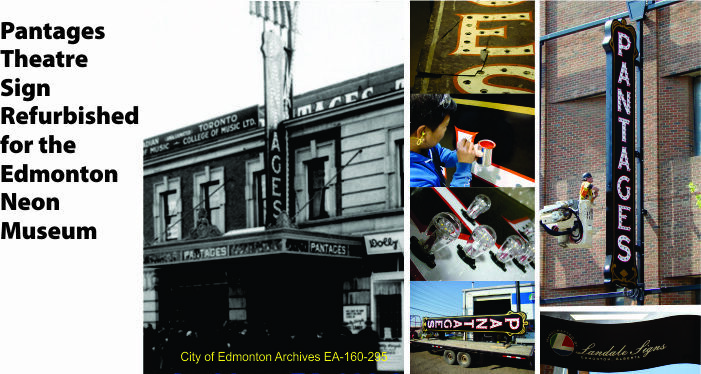 On Friday, May 6th, 2016, Landale Signs completed the installation of the restored Pantages Theatre sign for the Edmonton Neon Museum, on the side of the Telus building on 104 Street and 104 Avenue. Using the original Pantages sign for reference, the double sided, shaped cabinet was hand crafted by Landale staff. The lettering was traced from the original sign and executed using traditional quills and paints. Placement of the 166 light bulbs was also derived from the original 1920’s sign.